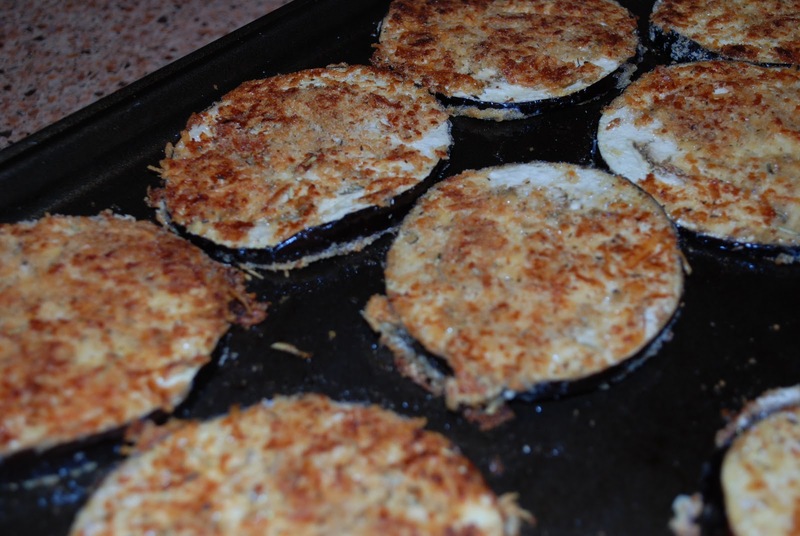 Gluten Free Oven Fried Eggplant is a delicious lighter fried eggplant recipe that can be used for making eggplant parmesan, eaten plain or used to make scrumptious eggplant mozzarella stacks. Our favorite way to eat oven fried eggplant is layered with fresh buffalo mozzarella, marinara sauce, fresh basil leaves and a good quality shredded Parmesan cheese. So incredibly delicious!! It’s deceivingly easy to make, too. Preparation only takes a few minutes and the results are worthy of a five star restaurant. Seriously, you need to make these oven fried eggplant stacks ASAP! Combine mayo and onion and spread evenly over eggplant slices on both sides with a pastry brush, being sure to coat each side for breading to stick. Combine breadcrumbs, parm, Italian seasoning and salt and pepper. Dredge eggplant in breading mixture. Place eggplant on a baking sheet sprayed with olive oil cooking spray. *Tip: Do not use an air bake cookie sheet, make sure it’s a regular baking sheet for proper browning. Spray the top of the breaded eggplant with a light coating of the olive oil cooking spray. Bake at 425 degrees for 12 minutes. Turn eggplant over and bake 10-12 more minutes or until golden. Ready to eat or use for your favorite casserole recipe! 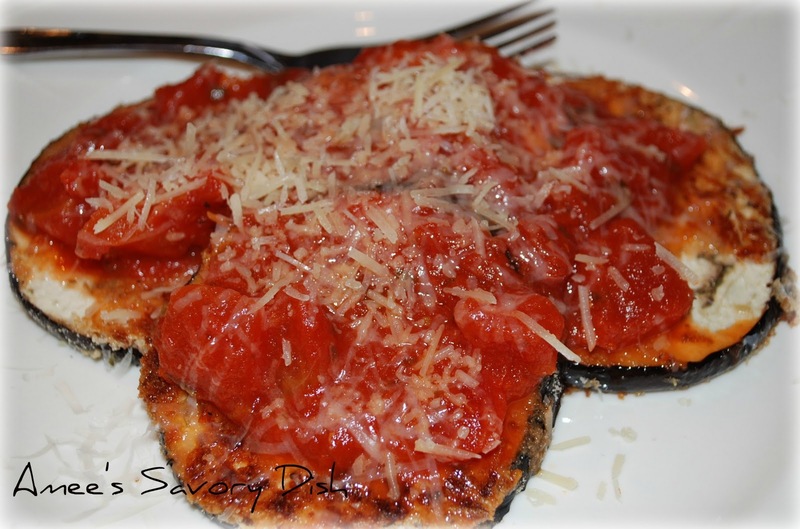 Layer oven fried eggplant in a 9×13 pan and top with marinara sauce, mozzarella cheese and fresh grated parmesan. Bake at 350 degrees F. until cheese is lightly golden. Spread a spoonful of your favorite marinara sauce or homemade marinara on the bottom of a small plate. Top with one slice of oven fried eggplant. Add another spoonful of marinara on top with a slice of buffalo mozzarella and fresh basil leaf. Continue with two more layers and top with marinara, fresh basil and freshly grated Parmesan cheese. 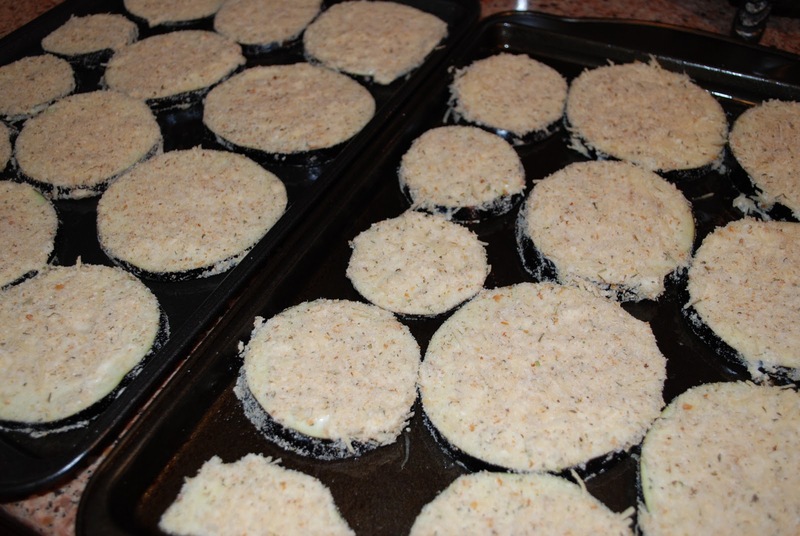 Combine mayo and onion in a small bowl and spread evenly over eggplant slices on both sides. Combine breadcrumbs, parmesan cheese, Italian seasoning and salt and pepper in a small bowl. Dredge eggplant in breading mixture. Bake at 425 degrees for 12 minutes. Turn eggplant over and bake 10-12 more minutes or until golden. You can also layer these in a 9×13 pan and top with marinara sauce, mozzarella cheese and fresh grated parm and bake until cheese is lightly golden.